From time to time, OGGOA will come across a plethora of news and notes that we wish to share with our readers. In those instances, we present a special post: Gator Bites. Enjoy. » An article published Tuesday by the Gainesville Sun brings Florida Gators fans numerous clarifications from head coach Urban Meyer about some of the most recent incidents and rumors swirling around the football program. It is important to remember that just because Meyer says something does not make it true as coaches cannot always be honest with the media and public. OGGOA will tackle Meyer’s statements one-by-one based on their appearance in the article. – (Will Dunlap play in the 2010 Sugar Bowl?) “It’s close to being finalized,” he said. “It’ll be done pretty soon.” Meyer also indicated he will sit down with athletic director Jeremy Foley and UF president Bernie Machen before making the decision. Three more Gator Bites are waiting for your eyes after the jump! » Former Miami Dolphins quarterback Bob Griese was a guest on ESPN Radio’s Mike and Mike in the Morning on Tuesday and was asked directly about Florida senior quarterback Tim Tebow’s future in the NFL. Griese answered “Yes” without hesitation twice when asked first if Tebow could play QB in the NFL and then if he would tailor his team’s offense around him. Griese went on to say that Tebow will not be a Peyton Manning, but he can win his own way. I wish some of these bozos in the media would learn what the letters “SID” stand for and get correct information before they publish anything – they, and others before they start spreading all these false rumors around. IMHO, I think Coach Meyer’s a little pissed off with all this stuff going around, and I’m sure he’s reading between the lines and seeing that others are trying to both discredit his football program and sabotage his recruiting efforts. If others think Meyer’s either naive or stupid, they’re sadly mistaken. 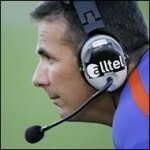 O-town, I think you are being a little too hard on the media and believing Meyer a little too much. As I stated early in the post, “It is important to remember that just because Meyer says something does not make it true as coaches cannot always be honest with the media and public.” Do you really think Meyer is going to say that one of his coaches knew about a party where underage players were drinking and did nothing about it? Would a coach really want to admit that a DC from a lesser school turned down his offer? I am NOT saying that Meyer is lying. But I AM saying that you cannot 100% trust what ANY football coach says, be it Meyer, Nick Saban, Bill Belichick, Bill Parcells, etc. In addition to protecting himself, the coach has to protect his players, the program and the school or organization. For example, UF denied OGGOA’s report earlier this year about the severity of Jenkins’ injury and the reported facts that he was seeking a medical redshirt and was out indefinitely. Meyer was asked about it after practice and said they expected him to return soon. What happened? EVERYTHING we reported exactly as we reported it. There are probably reasons they did not release that information, possibly because of medical privacy for Jenkins or maybe because he’s not in the media spotlight. Either way, I hope you see where I am coming from on this. Great to hear Coach Meyer even if it’s just a written interview and know he’s getting back into the swing of things. I an, and always will be, very skeptical and untrusting of the media. I’m not begrudging them their First Amendment rights, but they too lie – pardon me if I’m preaching to the choir, but knowing their penchant for twisting the facts and exaggerating stories, I’ll never completely trust anything they may say or print. In the Internet age, rumors and innuendo get spread around in a matter of seconds, and this too at times creates unpleasant and uncomfortable situations – case in point all this Notre Dame nonsense we were forced to deal with until last week when there was finally some much-welcome closure following the Brian Kelly hire. If indeed that was true about assistant coaches knowing about a party where underage drinking was involved, situations like that are likely to be handled internally by the staff unless something takes place that becomes part of the public record – which is what happened when Carlos Dunlap was arrested for DUI. That being said, you’re right about Meyer wanting to protect his program. He’s just as leery of the media for all the same reasons.